I have found that a beautiful native landscape doesn’t magically appear. It starts with a plan. By choosing the right plants that grow well together in your setting, you will avoid many of the challenges homeowners face after the plants are established. Plant selection is the most important step in the process of developing a native landscape, but it can also be the most challenging. How do you select the best plants for a particular setting? What do you need to do to insure their success? Here are the steps I use to choose the best plants for a site and design a landscape that is both functional and beautiful. You know your garden better than anyone. You know the soil type. Does it stay wet or is it extremely dry or something in between? You know how much sun your area receives during the day and throughout the year. You know where the water flows. Are there areas that you can utilize as a background or backdrop? Is there something you are trying to screen? Is there an area you are trying to develop? These are important questions that ultimately affect the types of plants you will choose. Site preparation doesn’t have much to do with plant selection, but it is an important step to consider as you develop your native landscape. You need to get perennial weeds such as bindweed and Bermuda grass eradicated before you plant your garden. If these weeds are not eliminated, they will overrun and out compete anything you plant. Trust me on this. I am still fighting these weeds in certain areas in my yard because I didn’t complete this step. It is also good to define the area with some kind of border. I have used metal edging, brick, limestone or landscape stone. 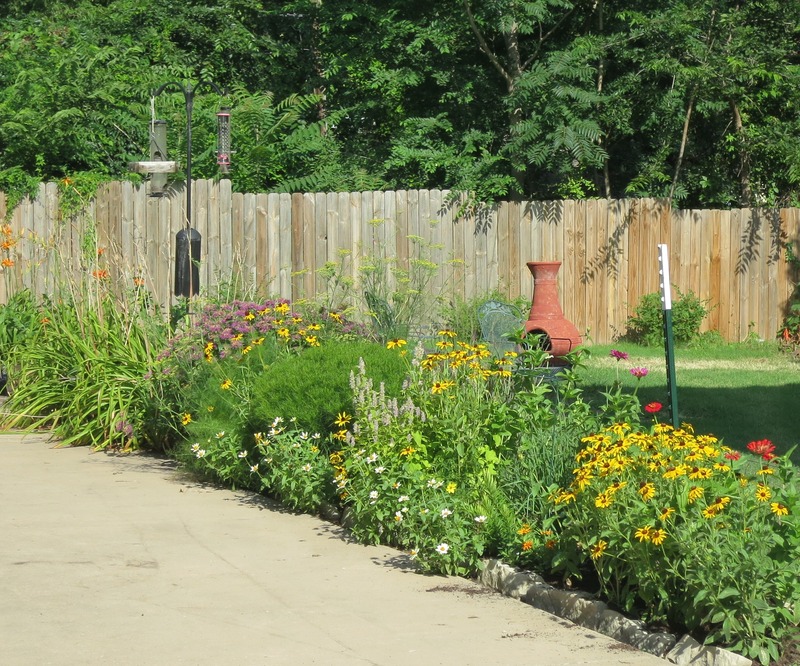 Edging makes your native garden look intentional. Develop an area you can manage and fits your lifestyle. You can always expand, but a bed that is too large can quickly become overwhelming. Once you have gathered all this information about your site and all the initial work has been done, you are ready to decide which plants will grow well together. The most important step in the selection process is matching plants to the site. You need to become familiar with every aspect of the plants through investigation, research and experience. I often start with one or two plants I know will grow in this location. Once I have established them as the foundation, the other plant combinations come easier. I design each landscape with the finished picture in mind. I consider heights, bloom time, habit, forms and textures. We often only think about these plants when they are in bloom, but don’t forget their other qualities, such as seed heads that provide visual interest in the winter months. It provides you an opportunity to highlight these qualities with another perennials or native grasses (e.g. coneflower seed heads against little bluestem). I group plants together for visual affect and stagger blooms throughout the season. You want something coming into bloom and going out of bloom from spring through fall. I include grasses for texture and movement during the winter months. Why plant a garden if you can’t enjoy it? I predict that your native landscape will be a hub of pollinator and butterfly activity. It will be an important link to other gardens in your neighborhood. 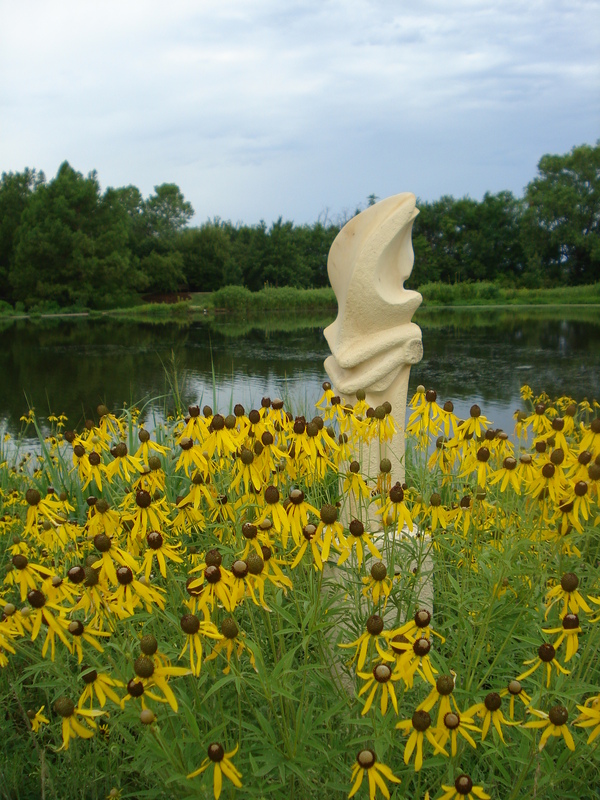 It may even inspire you to establish other prairie gardens in your landscape. Your success may influence others to follow your example. 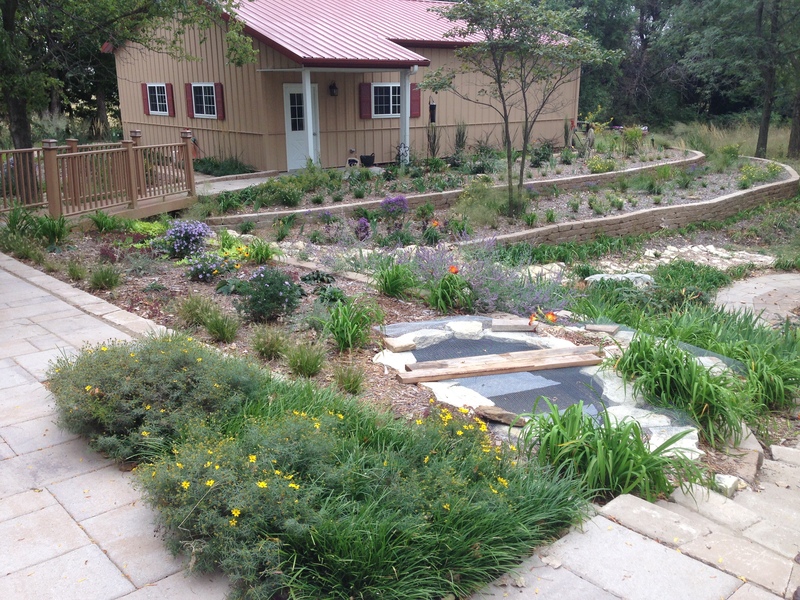 A native plant garden should be cherished, because you are helping the natural world in so many far-reaching ways. Believe it or not, your garden will have a positive impact. So get started! Let your imagination and creativity inspire your design. Phenology will make you rich and happy. Ask any person who likes to watch/study plants, animals, and/or climate if their life is richer and happier because of their observance of phenology, and they will unanimously agree. I’m not talking about monetary riches. The study of phenology has made very few people rich in dollars. In fact, many people I know spend a fair bit of money in their pursuit of phenology studies (i.e., birders). I am referring to the put-a-smile-on-your-face, educational, blood pressure-lowering, life enriching observance of the natural world around you. Phenology is the observance of cyclical and seasonal natural events. These phenomena occur all around us in nature: plants blooming or setting seed, migrating animals arriving or leaving, the first or last killing frost of the year. For millennia, these kinds of observations have been not only interesting and enriching to our human ancestors, but they have been critical to health and survival. Being successful with agriculture, hunting and gathering required an intimate connection to the natural world through careful observations and record-keeping. 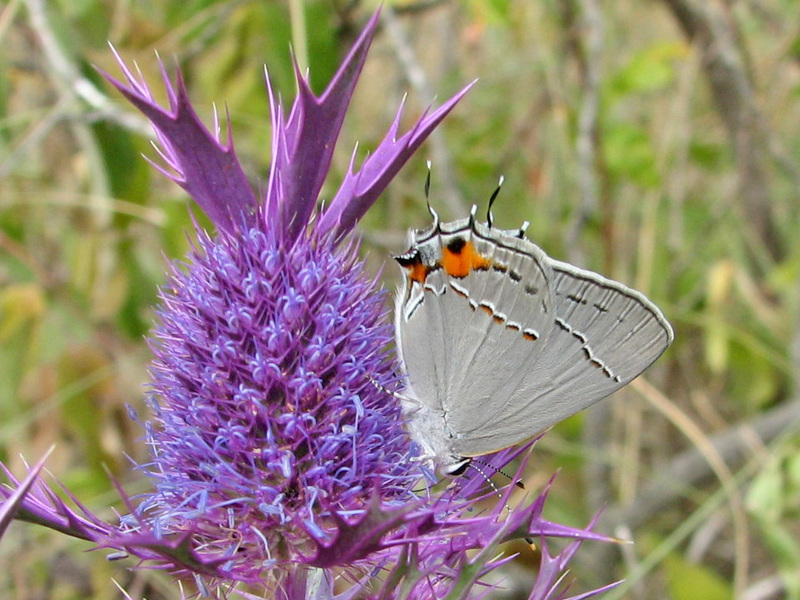 Gray hairstreak on Leavenworth eryngo. The USA National Phenology Network provides great insights and resources related to the study of phenology. 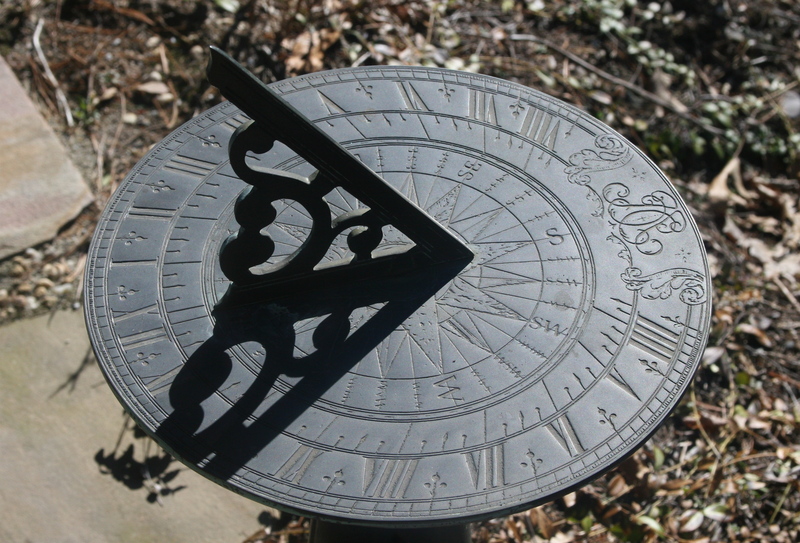 They highlight some good reasons for observing phenology. I’ve added to their list and included my perspectives as well. 1) Detecting Climate Change Impacts – Quantitative documentation of the natural world through scientific data collection is critical to understanding the effects of a warming planet. From professional scientists to common folks practicing hobbies of citizen science, phenologists help us better understand what is happening in the natural world around us. If we didn’t have scientific observations to help us learn about changing trends, we might never recognize the changes until they become glaringly obvious and have negative, irreversible impacts. Think of the boiling frog metaphor here. Collecting data on annual trends in weather, the timing of life cycles of plants, and the migration patterns of animals all give us sound evidence to monitor changes in our planet. 2) Ritual Celebrations – We are social creatures that enjoy regular celebrations, and it is easy to connect them to phenology. There are the obvious examples of fall color festivals and cherry blossom festivals. For me, even religious and cultural celebrations have a relationship to phenology. Christmas has a deep meaningful connection to the long, cold nights and dormant prairie of the winter solstice. A favorite September music festival always happens around the peak of the fall monarch butterfly migration and the flowering of Maximillian sunflowers. Butterfly milkweed in bloom tells me it is time for our early June Earth Partnership for Schools (EPS) summer institute. 3) Enjoying A Connection to Nature – Connections to the natural world make us happy and feed our souls. Even if folks from Psychology Today, BBC, and The Nature Conservancy didn’t vouch for it, I’d say this is true from my own experience. Experiences in nature enhance our connections to friends and family and solidify memories for a lifetime. At our EPS summer institutes we examine children’s increasing disconnectedness to nature and how we can reverse those trends. Teachers regularly recall how important outdoor events in their own childhood left lifelong positive impressions and important connections with people. The thrill of catching blinking fireflies with neighborhood kids, the sounds of buzzing cicadas around shortest nights of the year, witnessing a toddler son’s first taste of a tomato in the garden, watching the arrival of bald eagles fishing over big rivers in the heart of winter, observing sunsets with grandparents, and so many other examples have been shared. These sorts of positive experiences inspire many to want to share a love of nature with succeeding generations. 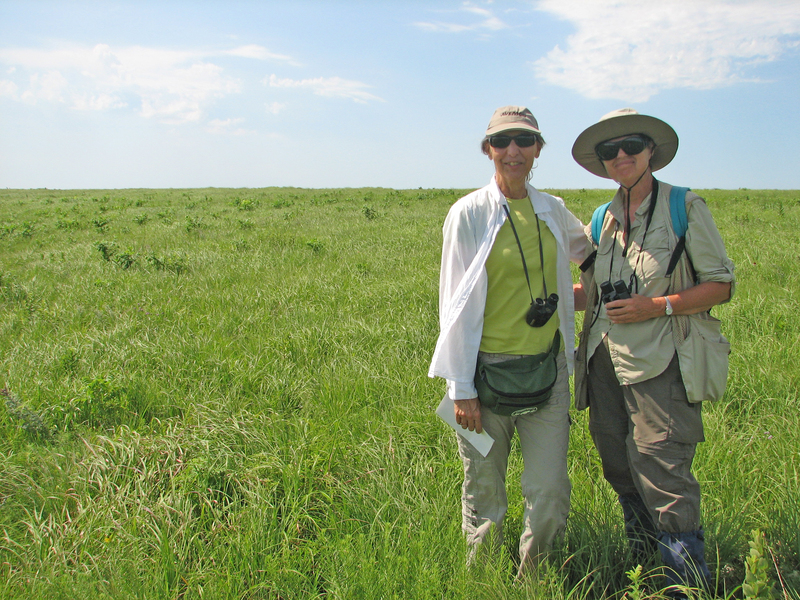 Iralee Barnard and Susan Reimer find happiness in spending a day on the prairie counting butterflies. Personally, I am drawn to the phenology-loaded pursuits of native plant conservation, and butterfly and bird watching. I spend time at Kansas Native Plant Society board meetings focusing on ways to best educate Kansans about the fascinating flora across our state. Annual butterfly counts in Harvey County and at Tallgrass Prairie National Preserve document summer butterfly populations and contribute citizen science to the North American Butterfly Association that monitor continental trends. Kansas bird watchers organize under the Kansas Ornithological Society and passionately spend weekends and holidays throughout the calendar year in all weather conditions across the state to document in detail the presence of bird species. Collectively, the folks I have met at these events are smart and endearing, generous with their time in teaching others, fun to be around, and happy doing what they are doing. I am proud to call them my tribe. If I had more time, I would extend my interests to hunting and fishing as well. I eat meat and I can’t think of a better and more meaningful and enriching way to live and eat than to be a hunter and gatherer. Most hunters I know are very biology-literate and are also good stewards of the land. The efforts of these groups help us better understand the biology and ecology of Kansas. In subtle and inspirational ways, they inspire others to follow their lead, and it is my hope that this infectiousness will extend to the next generations as well. After all, they are the future caretakers and stewards of natural Kansas. 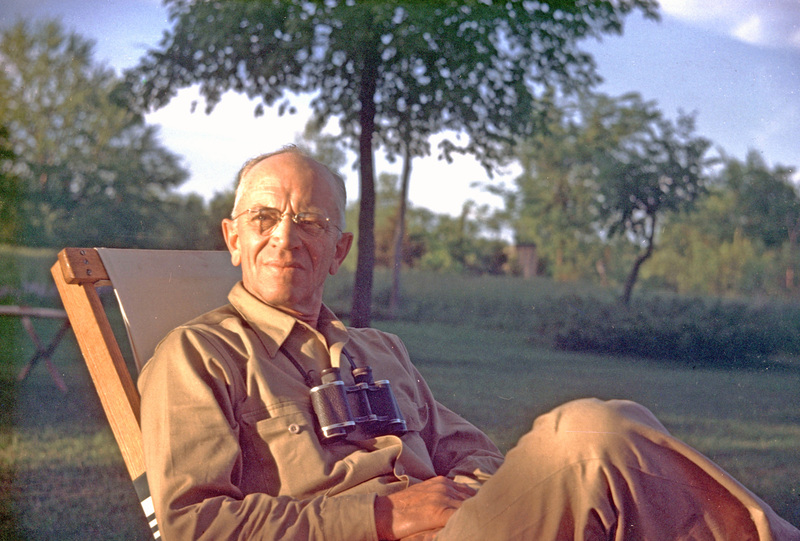 One of the most famous phenologists was Aldo Leopold. In the early 1900s he studied phenology through spending weekends at “The Shack” with his family along the Wisconsin River. His observations, land stewardship practices, hunting outings, and scientific studies as a professor were all synthesized into the poetic writings of the book A Sand County Almanac. Leopold’s thoughts on land conservation and specifically his chapter entitled “The Land Ethic” will guide many of our Dyck Arboretum activities and events in our coming 35th anniversary starting this fall. We think they will make you rich and happy. 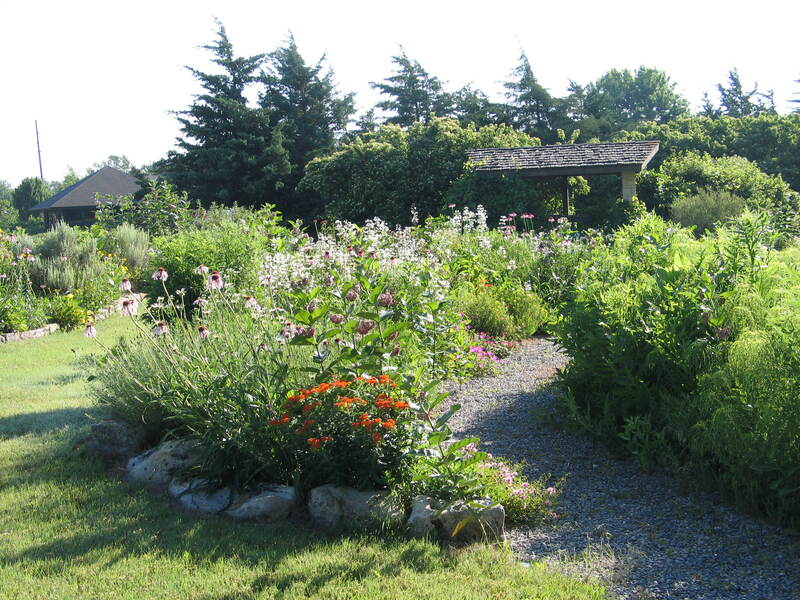 A well-designed garden has many different forms, colors, heights, bloom times and textures. Plants are integrated in ever-changing combinations that should be appealing to us and the wildlife we are trying to attract. Obviously, pollinators depend on diversity of plants and being able to find the food they need. Shrubs are an important nectar source for many different pollinators, particularly for bees. By including just a few of these in your own landscape, you can have a beautiful and productive garden that makes a difference in their survival. Here is a list of shrubs for bees to feast upon. 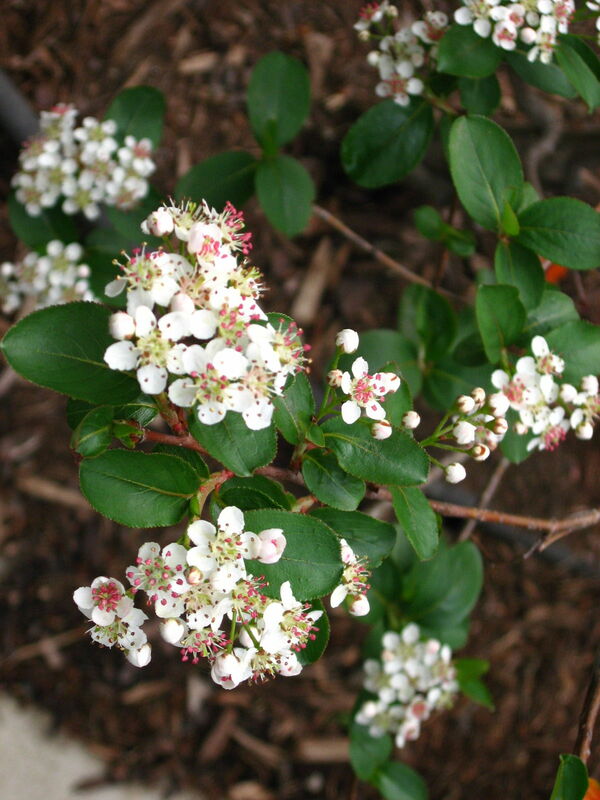 Black Chokeberry–Aronia melanocarpa-The tiny white blooms of this ornamental shrub attract many different types of bees. The black fruit is a bonus to be eaten fresh or left for wildlife. Look for varieties like ‘Autumn Magic’, ‘Iroquois Beauty’ or ‘Viking’ to add to your garden. Western Sand Cherry–Prunus besseyi ‘Pawnee Buttes’-This wonderful, easy to grow landscape plant has an abundance of sweetly scented flowers in the spring followed by black cherries in the summer. The glossy green leaves turn shades of red and purple in the fall. It only grows to 18 inches tall by 4-6 feet in spread making it a fantastic ground cover. Coralberry–Symphoricarpos sp.-This is a shrub that is grown for its ornamental berries. However, the tiny blooms are gladly used by bees. The summer’s flowers swell into pinkish white pearls along arching stems. The fruit is persistent well into winter. “Candy™’ or ‘Galaxy™’ are forms with great fruit clusters. 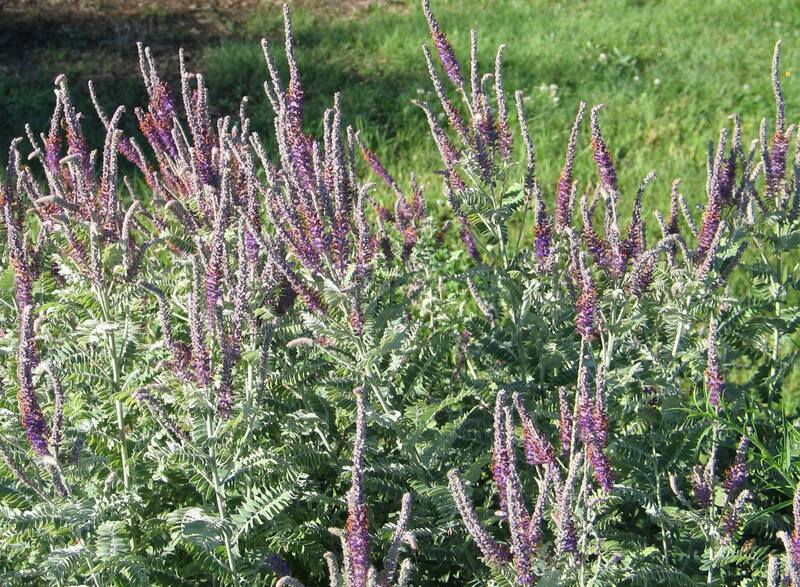 Lead Plant–Amorpha canescens-This is a great butterfly bush alternative. The purple flower spikes in late spring atop the silvery gray foliage are extremely attractive. Bees cover these plants while blooming. 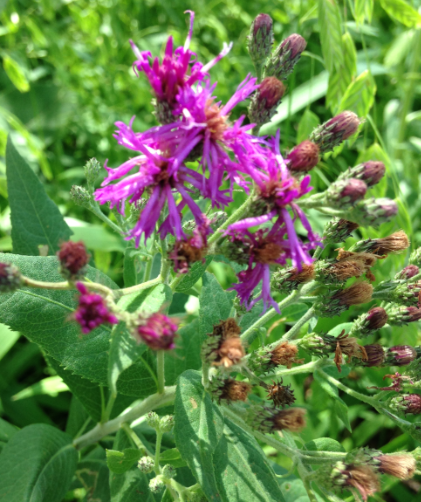 It is a native wildflower that thrives in a sunny spot. 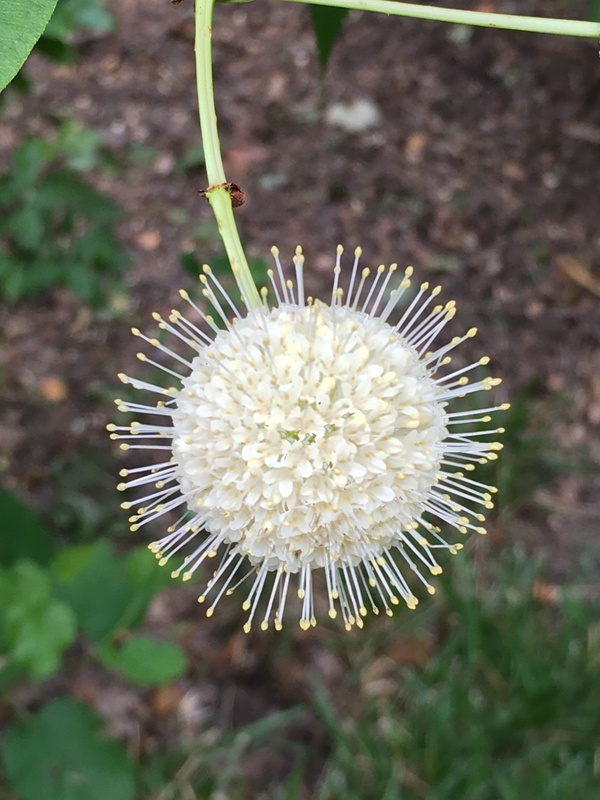 Buttonbush–Cephalanthus occidentalis-The unusual, fragrant flower balls of this native shrub are magnets to a host of pollinators. I have seen up to two dozen swallowtail butterflies on one plant when in bloom. ‘Sugar Shack®’ is a shorter form that works well in the landscape. 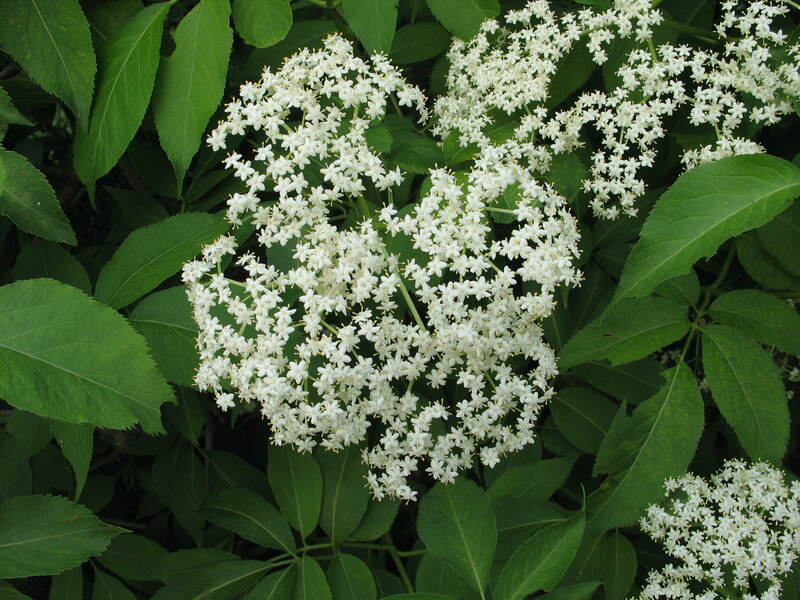 Elderberry–Sambucus canadensis-As you drive the highways in summer, this shrub is everywhere. The creamy white blooms pop out of the landscape especially against the glossy green foliage. These flat topped clusters of flowers make great landing pads for bees. The fruit is tasty and very high in antioxidants. ‘Adams’ and ‘York’ are native forms selected for their larger fruit. Other non-native forms like ‘Black Lace’ and ‘Lemony Lace’ are more refined alternatives for the landscape. Spicebush–Lindera benzoin-We have had success growing this as an understory shrub. The tiny yellow flowers attract bees and the leaves have a spicy smell when crushed. Plants develop a nice yellow fall color. 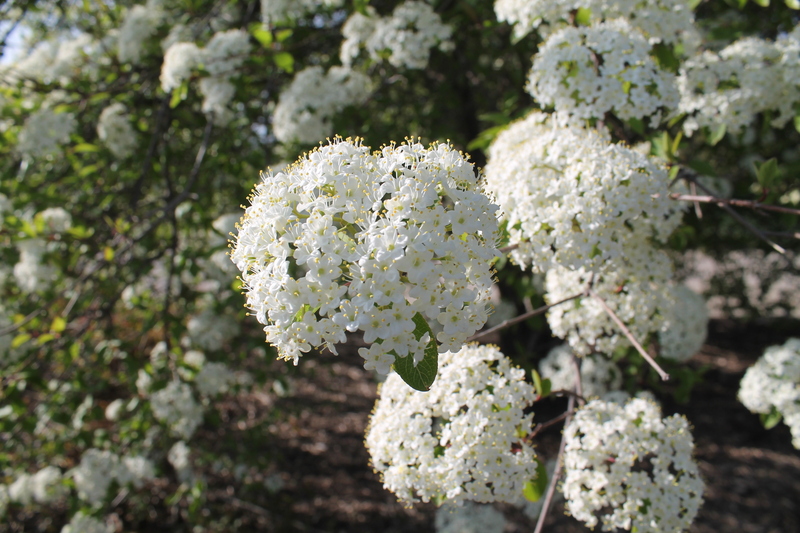 Viburnums-There are too many of these shrubs to mention, but I will highlight our native to Kansas varieties, which have beautiful white flowers in the spring followed by clusters of purplish fruit that develops later in the summer. Viburnum prunifolium has smaller oval leaves that develop reddish-purple fall color. Viburnum rufidulum has shiny leaves that turn burgundy-purple fall color. Each of these shrubs can grow to 12 feet tall. Certainly, there are other shrubs for the landscape such as Beautyberry-Callicarpa americana, sumac (Rhus sp. ), Roughleaf Dogwood-Cornus drummondii, American plum-Prunus virginiana, Clover Currant-Ribes odoratum, and serviceberry (Amelanchier sp.) that deserve more use in landscapes. Many of these shrubs have been pushed aside for ornamental varieties that are nice to look at, but offer nothing to wildlife because the flowers are sterile. By strategically choosing plants that are both beautiful and alluring to bees and other wildlife, your garden will become a haven for pollinators.